This is a seriously image heavy post…28 pictures. I didn’t want to break it up because…well, I didn’t want to. 😉 It’s my eye candy and Friday Red. Enjoy! All of these were two coaters and they dried in record time. BOOM! Right out of the gate…this is my favorite red this season. Beautiful. Opaque in 2 coats. I liked this, but it’s not my favorite red. It’s a bit too light for me. I am sure it would look better on someone else where it looked ok on me. A gorgeous mulberry with a shimmer that makes it a perfect holiday shade. I didn’t think I would like these, but I do. CTY is a lovely metallic foil that some other brands didn’t quite get right. This really sparkled and shined, truly reminding me of tinsel. MK was a lovely rich foil gold…absolutely gorgeous and I kept thinking it was a wonderful shade of almost 18k. 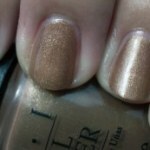 Jingle bells is a bronze that doesn’t quite shimmer like CTY and MK, but it is very subtle. While not flashy, it’s still a pretty shade to behold. A sheer white base with white glitter thrown in…it reminded me of snow. This is a wicked shade of green…it glows. I swear, it generates its own electricity! Wouldn’t you agree? I mean, just look at it. A wonderful blue, but it really reminded me of OPI’s Yoga-ta Get This Blue. The jury’s still out on this color. I can’t decide if I like it or not. It’s a pinky/red jelly based color with pinky/silver glitter. Removal was a pain, but I’m not sure about this. I no longer mourn the loss (that much) of my beloved Chanel Rouge Noir. How can I with these fabulous dupes that are 3-Free? Oh the glitter…the humanity. THE SHINY! I like it a lot, but ugh…the removal. The removal is a pain. How pretty is this? 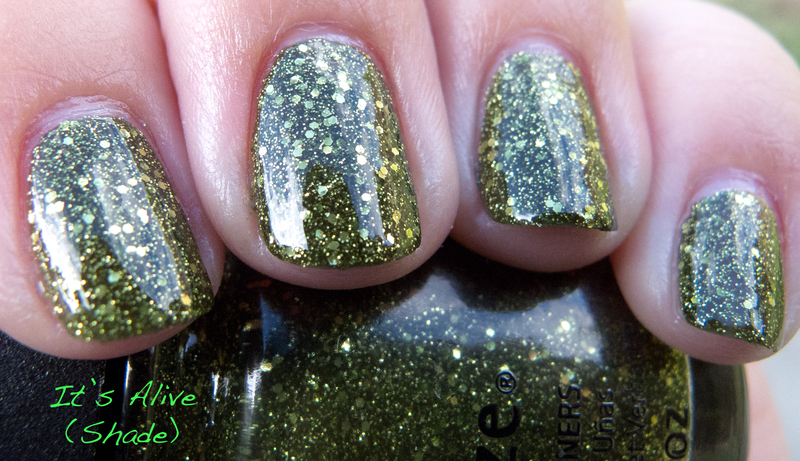 I love that it’s an olive green tossed into the mix…to make it even 700 shades more awesome, they made this a shimmer. Fabulous! White creme…’nuff said. I think of this as a base for nail art and not just a color to be worn on its own. This is China Glaze’s answer to OPI’s Tease-y Does It. 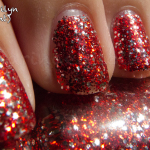 I like both and I like that this is lighter and has a fine micro glitter. Of course, I had to include Mistletoe Kisses because it’s part of the collection, even though I had done a comparison earlier in the week. FYI: MMUTM = Meet Me Under The Mistletoe. And there we go…all 16 colors swatched. Yay! Hope you enjoyed it.